Texas de Brazil, Syracuse, N.Y.
I’m not sure that there is a better characterization of our Friday evening visit to Texas de Brazil at DestinyUSA. I’m certain that one could go to this all-you-can-eat steakhouse, show some restraint, and experience it in a manner that doesn’t result in paralysis and food coma. It would require willpower and knowing your limits, two things that I do not possess. Texas de Brazil sits at the back of the Canyon entrance to DestinyUSA, in a court of other higher-end chain restaurants like Cantina Laredo, P.F. 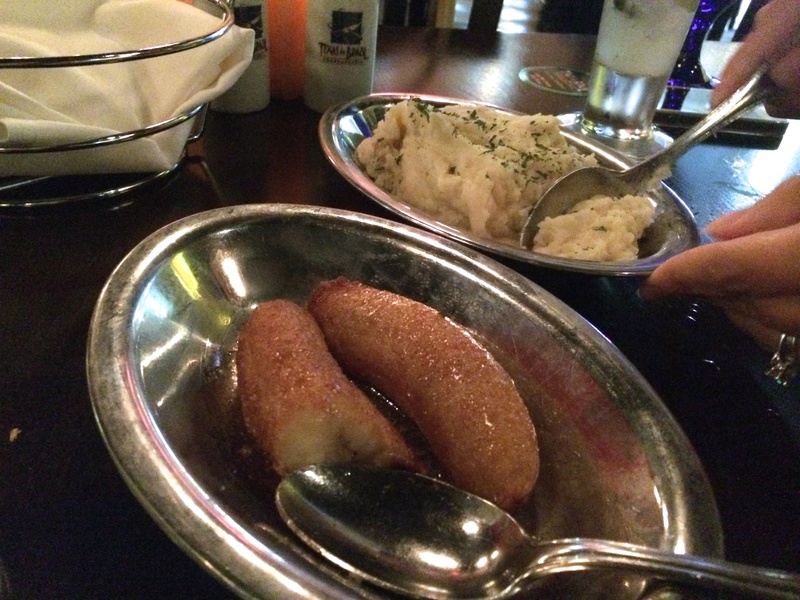 Chang’s, The Melting Pot and Gordon Biersch. The concept is Brazilian churrascaria, where passadores, or servers, come to your table with swords of meat, called rodizios. Typically, one flips a painted rock to indicate whether they would like more food or to signal that they need some time to eat. 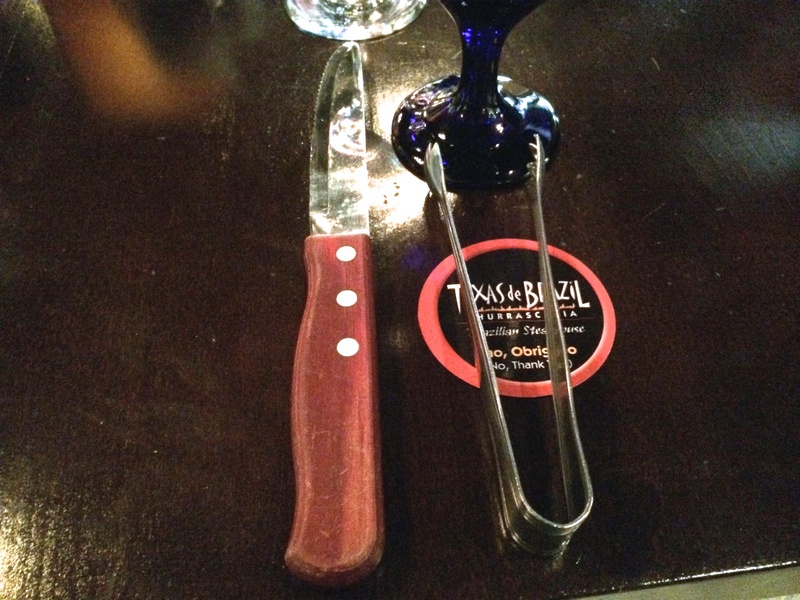 At Texas de Brazil, one receives a laminated card that is typically ignored by the sword-bearing staff. The Turning Stone Resort had a Brazilian steakhouse that The Wife and I had been to prior to its closing. We were early for our 6:15 p.m. reservation, but were seated immediately in the less than half full dining room. Elizabeth, our server, greeted us immediately with an explanation of how food was served and the house wine list. While not extensive, the wine program at Texas de Brazil focuses on South American wines, as well as its private label bottles. A list of a dozen or so signature drinks is led by three different varieties of caipirinha. The standard list of large-scale America beers are available, as are a pair of imported Brazilian beers. Churrascarias in America typically begin with salads and appetizers from a large communal bar. 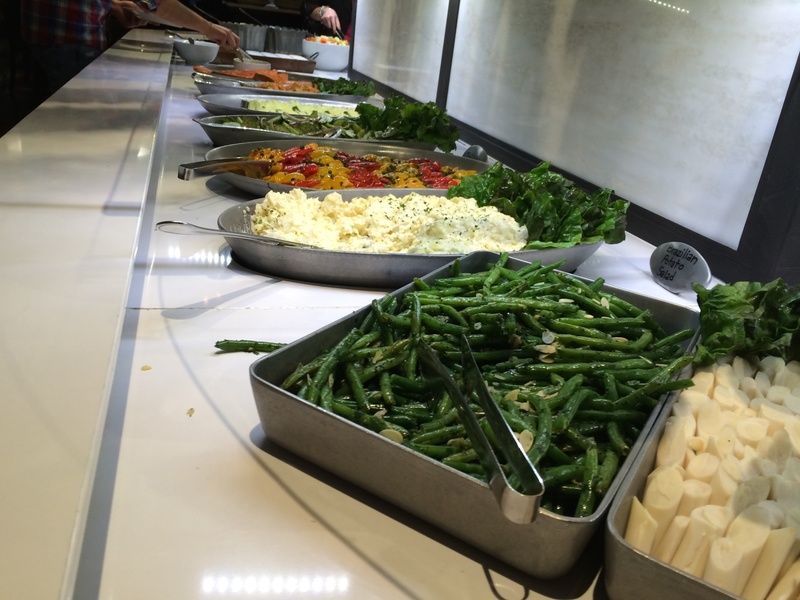 The Turning Stone’s cold bar included salads and sushi. 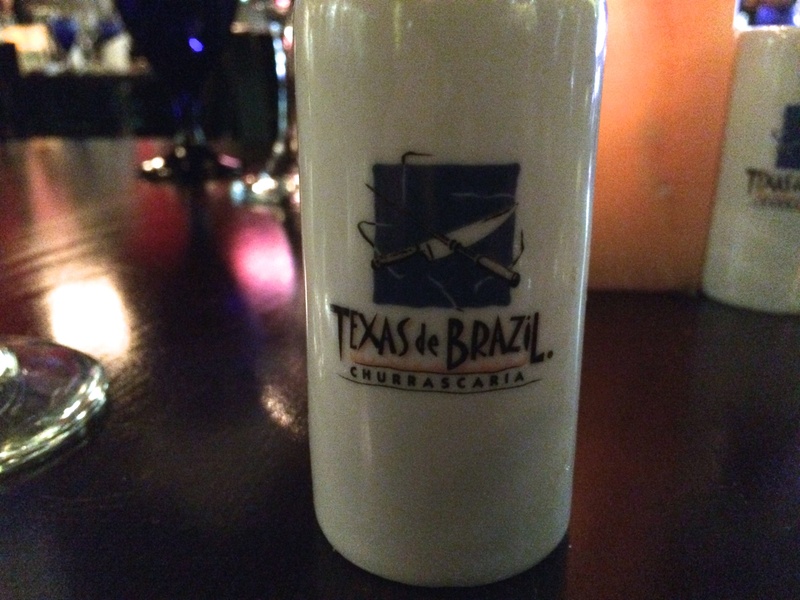 Texas de Brazil had about 60 items, including a California roll, green salads, charcuterie, and other cold salads, as well as a bar of steam tables. The lobster bisque was good, but too heavy on the wine to notice the flavor of the lobster meat. The stand out was the feijoada, or Brazilian-style black beans. Rich and flavorful with large pieces of beef and pork, the beans and accompanying jasmine rice could have been a meal unto themselves. But, we weren’t there for beans and rice. We were there for meat. Elizabeth brought sides of garlic mashed potatoes and fried bananas, the latter a palate cleanser, to the table and the card was flipped to indicate that the passadores should start making their way over. 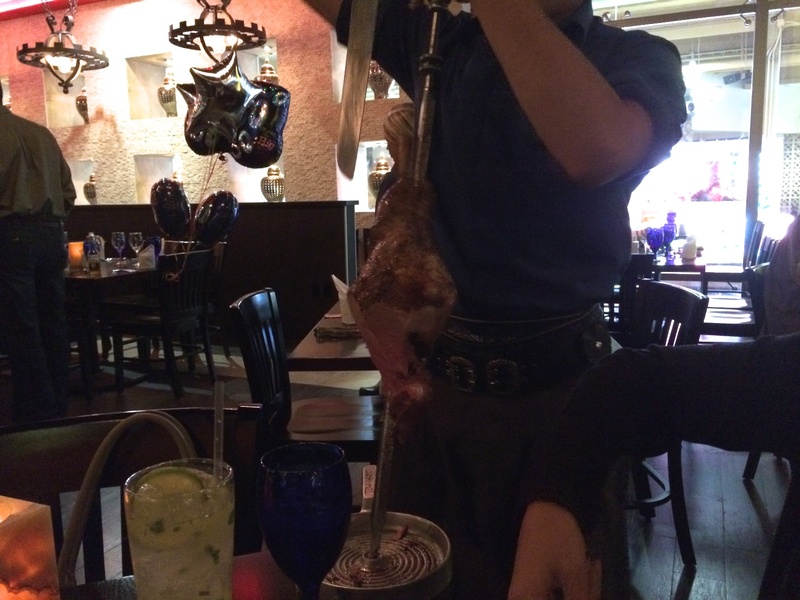 Texas de Brazil boasts 16 different cuts of meat on its menu. We saw 14 of them: filet mignon, filet mignon wrapped in bacon, braised beef ribs, lamb chops, pork ribs, Brazilian picanha, garlic picanha, linguica, leg of lamb, chicken breast wrapped in bacon, parmesan drumettes, flank steak, herb-marinated pork loin, and Brazilian alcatra. The two most traditional Brazilian cuts of beef, the alcatra and picanha, were the most regularly offerings during the meal. Sliced razor thin, diners use a set of tongs to grab their offering from the passadores. The alcatra is top sirloin, but carried enough of a fat cap where it resembled shoulder or ribeye. The picanha was leaner, but tougher as it was cut from the rump. It is offered plain and garlic-marinated. The lamb leg was a highlight. Very moist and full of flavor, it was offered once to our table, as compared to the lamb chops which made 3 to 4 stops. The linguica also stood out, with a spicy punch and strong pork flavor. It too made far too few appearances, even though it was requested. Everything else was nice, but ordinary. I enjoy filet mignon, but it the Texas de Brazil version was no better than what I can make at home. 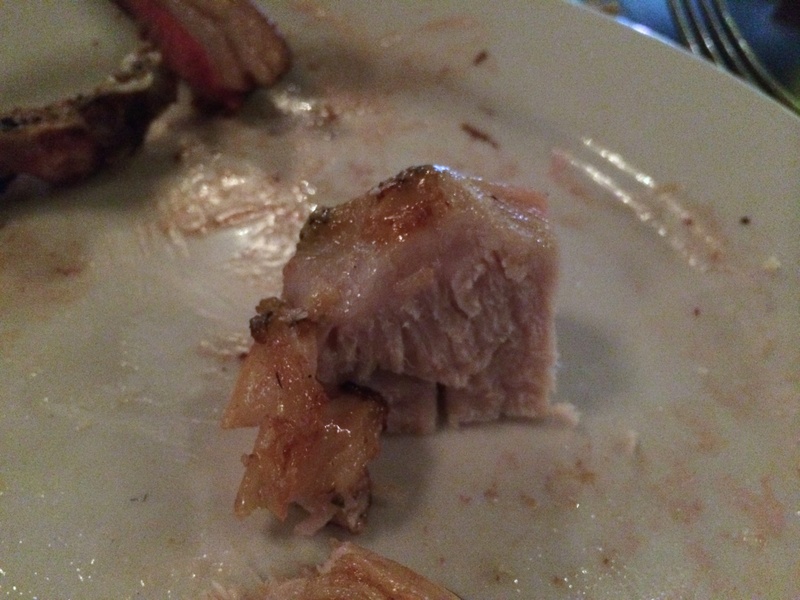 The chicken seemed out of place and the pork ribs were mediocre at best. All of the meat is salt-crusted and prepared medium-rare, except for the poultry. Meat can be cooked without salt or to a higher level of doneness by request. The pacing was inconsistent, as we would find ourselves with two or three passadores stacked up tableside in some instances, and no one nearby at times when we were ready. The red/green card was meaningless as well, with passadores offering meat while we had flipped to red. The food paralysis was self-induced, as I could have said no when servers stopped by with more food. But, I would also lay some blame at the need to find value within the $44.99 price tag. One could lull themselves into asking for more when a passadore leaves a 4 oz. filet mignon or thin slice of lamb on your plate. By the time you realize that you’ve had too much food, it’s too late. 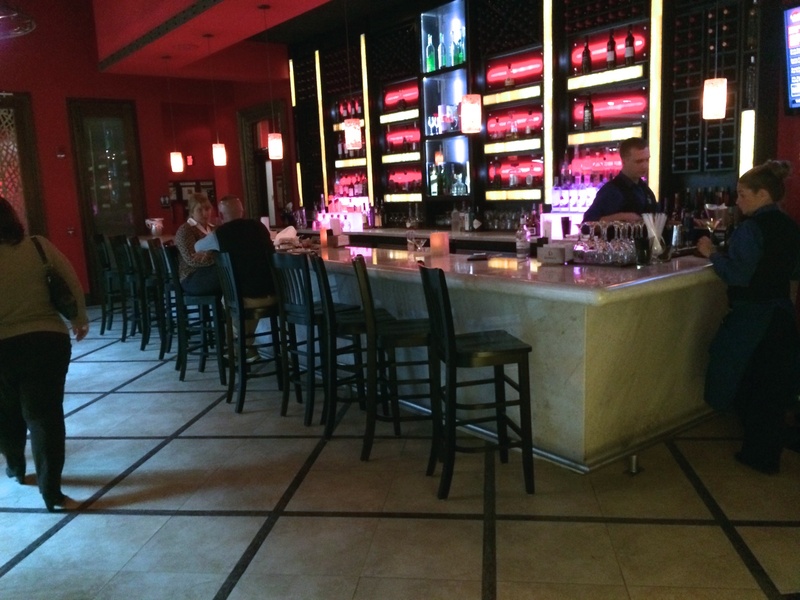 Texas de Brazil is located on the first floor of DestinyUSA’s Canyon section. Reservations are accepted by phone and OpenTable. Dinner and drinks for two was $116 before tip. (c) 2014 Jared Paventi. All rights reserved.